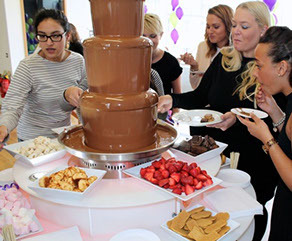 Besides being a focal point for the whole party, chocolate fountains are delicious, fun and will have all your guests talking about the event long after it has finished. Our fountains almost always exceed all expectations. The finest unlimited Belgian chocolate, a large selection of your favourite dips, skewers, plates, napkins, illuminated surround and base. All of our fountains come with fully trained operators who will be on-hand to serve, replenish dips and ensure your guests enjoy their time. 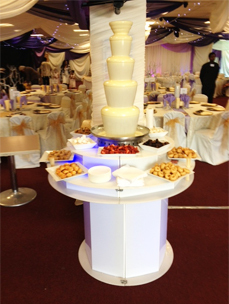 We can also supply a stainless steel champagne/beverage fountain for 'dry-hire'. 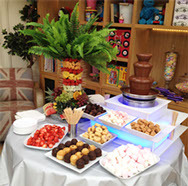 Flavours include Baileys, PIMMS, Champagne, Fruit Punch, Sangria and many, many more. Perfect for your corporate event or outdoor party. 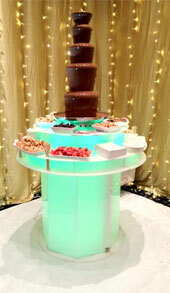 Interested...then contact us now to book a Chocolate Fountain or Drinks Fountain for your event.